The Chinese Ministry of Health announced on November 23 that another person has died of avian flu in Anhui Province. This brings the total number of confirmed human cases of bird flu in mainland China to three. A 35-year old woman from Xiuning County, Anhui, whose surname was Xu, began displaying symptoms of fever and pneumonia on November 11. On November 22, her condition became critical. Even after extensive medical care, she died of infection. The patient had previously had contact with dead poultry. On November 21, Chinese Center for Disease Prevention and Control re-investigated the results obtained by Anhui&#039s Disease Prevention and Control Center and confirmed that the patient&#039s tracheal secretions contained the H5N1 avian flu virus. Based on the patient&#039s symptoms, epidemiological investigations and lab test results, an expert group from the Ministry of Health determined that the patient was definitely infected by a highly pathogenic form avian flu virus. The Ministry has already issued an announcement to the World Health Organization, the governments of Hong Kong, Macao, Taiwan and some other countries regarding this new case. The Ministry had previously announced two confirmed cases of human infections by the H5N1 avian flu virus on November 16. 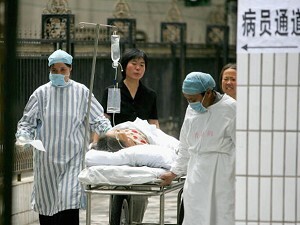 The first was the case of Zhou Mao-Ya, a 24-year old woman from Zongyang County, Anhui, who died after the infection. The second was that of the boy He Junyao from Xiangtan City, Hunan Province, who actually survived the infection. A suspected case was the boy&#039s sister, He Yin who unfortunately died. All these individuals were infected by eating infected chicken or duck.